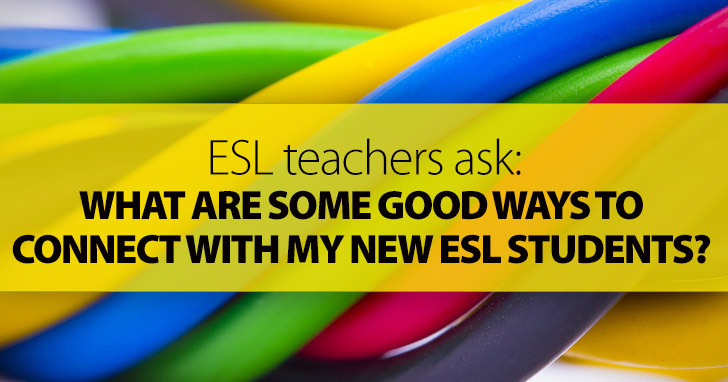 ESL Teachers Ask: What Are Some Good Ways to Connect with My New ESL Students? The school years starts, and you look forward to greeting a fresh batch of smiling, eager faces. They may have the same reason for taking your class; they may have different reasons. Is it enough to simply find out what those reasons are? Is it enough to “interview” them about their lives, their likes and dislikes? You know where this is going. The answer is no. It’s not enough to simply get to know them (though it is an essential step!) The best thing you can do to get the year off to a great start is to connect with them. Connecting with your class on a deeper level is mutually beneficial. It helps build trust and sets a solid foundation on which to build effective learning experiences. How are they sitting? Do they look relaxed or tense? Is one of them biting his/her nails? Or chewing on a pencil? How many are sitting with their arms crossed? Before they even utter their first words in English, your students can tell you a whole lot about themselves through their posture and body language. See if you can find ways to make them feel more relaxed – try an icebreaker! Smile – and Do It Often! So you’re not good at telling jokes; you don’t know how to make people laugh. But you don’t have to be the funniest teacher in the school to connect with your students. After one of the first classes I ever taught, one adult learner took me aside and said she thought the class had been impeccably delivered. But she also noticed I had not smiled. Not even once. She challenged me to give it a try. And from then on, it was a lot easier for me to connect with students. It’s a very simple gesture, but it goes a long way towards showing your students that you are a friendly, human being and not just a robot spewing lessons. You can’t be their best friend, and you can’t share every private aspect of your life. But you can choose to share a few of the things that make you who you are. Students invariably ask where you learned English, for example. I always tell them I lived half of my life abroad and grew up in the US. Their interest is always piqued, and the information you share may lead to interesting questions/discussions. So you’re practicing asking for/giving directions and one student recalls the time he/she got lost in New York City. Share your own anecdote or ask another student to share. We are not that different from our students in that we can have the same kinds of experiences. How awesome is it when your class realizes that something that happened to them also happened to you? Gadgets in the ESL classroom? You can read my opinion and some tips regarding this in this article. You’ll have to check school policy regarding the use of cell phones and other devices, but if they’re allowed, I say let them use them in the classroom - under your supervision, of course. If you can’t beat ’em, join ‘em, I always say, and there’s plenty you can do in class with cell phones and tablets. Whenever possible, let them choose what to write about, which game to play or which video to watch. You don’t want the class to become a free-for-all? Give them three to four options to choose from. They’ll still be choosing. But you’ll earn their trust by letting them have some say in what goes on in the classroom. Teachers are sometimes put on pedestals. But how can you reach and connect with your students when you’re looking down from above? On the other hand, teachers are sometimes their students’ buddies or friends. You should not be one or the other. Simply show them that in many ways you are no different. The only difference is that you have mastered a skill that they’re trying to learn. And that they can trust you to help them acquire it.